Salt is an excellent weed killer because it will kill weeds, but will dilute away to harmless levels naturally with rainfall. You need to be careful though because overly salting your soil will make it inhospitable to any plants. Be sure to only spray directly on weeds. The combination of the vinegar, salt and dish soap in a targeted spray for the weeds is an easy recipe for naturally eliminating weeds. Again, make sure you avoid spraying this on your crops. The solution can be ingested without causing harm to animals or humans but it will likely cause your crops to burn and die if you accidentally spray them. 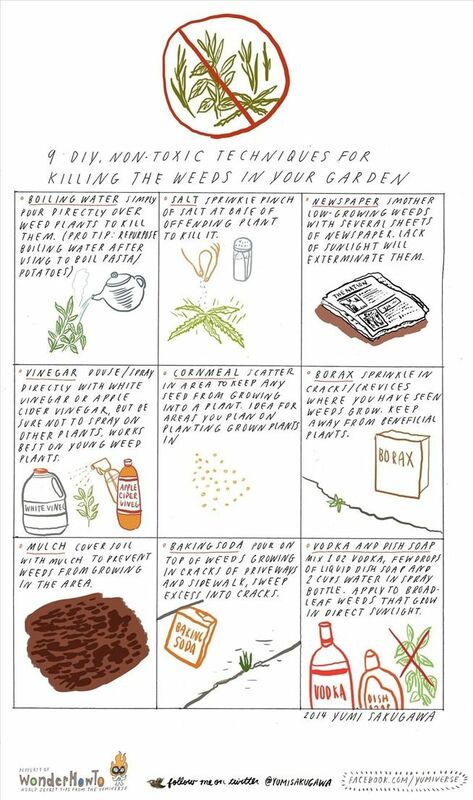 Cover the weeds in salt, when it rains the salt will soak into the weeds and ground preventing regrowth. In a spray bottle: A small hand sprayer is useful for small areas or precision spraying in soiled areas with ornamental or edible plants.